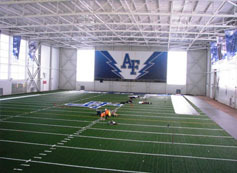 The United States Air Force Academy Endowment, on behalf of the United States Air Force Academy and the Association of Graduates, hosted the dedication and ribbon cutting ceremony for the new Holaday Athletic Center on Friday, July 22. Over 500 people attended the dedication and ribbon cutting ceremony, traveling to the Academy from all over the nation. Gen. Norton A. Schwartz, the Chief of Staff of the U.S. Air Force, was one of the featured speakers at the ceremony. The Holaday Athletic Center is the largest privately funded capital project in Academy history, housing a regulation field sized to accommodate lacrosse, football, and soccer, in addition to many other athletic activities. This project was made possible by a generous lead gift of $5 million from Bart and Lynn Holaday, Class of 1965--the largest gift from a graduate to the Academy in the institution's history. Additionally, a similar contribution came from the estate of Colonel Joseph and Dorothy Moller, two longstanding supporters of the Academy. "Lynn and I shared a dream of creating a safe and weatherproof place for our cadets to develop as leaders on the `fields of friendly strife,'" Holaday said. "Thankfully, many other members of our Academy family shared this dream--it would not have been possible without their generosity, cooperation and support." "This tremendous athletic facility will help our cadet-athletes train year-round and stay competitive in Division 1-A athletics," Director of Athletics Dr. Hans Mueh said. "The generous gifts from Bart and Lynn Holaday and the Moller Foundation are vital as we continue to develop future leaders for the Air Force and the nation. We are grateful for their dedication to the Academy." "We are thrilled to receive such an unprecedented gift and appreciate Bart and Lynn Holaday's generous and thoughtful support of our Academy," Academy Superintendent Lieutenant General Mike Gould said. "This facility is the first, of what we're hopeful will be many, 100 percent donor-funded major infrastructure enhancements at the Academy. The Holaday Athletic Center will be a part of our cadets' daily lives. Every time they see this landmark, they will know that it was built specifically for them by the dedicated graduates and friends of the Air Force Academy." General (Ret.) Lorenz, president of the USAFA Endowment, shared his thoughts on the importance of the new facility: "The completion of the Center marks an important milestone in the growing culture of support for the Academy. This success is entirely due to the efforts of our thriving community of graduates, parents and friends of this great institution, and I am honored to celebrate this amazing achievement with them."